Serial ATA (SATA, abbreviated from Serial AT Attachment) is a computer bus interface that connects host bus adapters to mass storage devices such as hard disk drives and optical drives. Serial ATA succeeded the older Parallel ATA (PATA) standard,[lower-alpha 1] offering several advantages over the older interface: reduced cable size and cost (seven conductors instead of 40 or 80), native hot swapping, faster data transfer through higher signaling rates, and more efficient transfer through an (optional) I/O queuing protocol. SATA has replaced parallel ATA in consumer desktop and laptop computers, and has largely replaced PATA in new embedded applications. SATA's market share in the desktop PC market was 99% in 2008. PATA remains widely used in industrial and embedded applications that use CompactFlash (CF) storage, which is designed around the legacy PATA standard, even though the new CFast standard is based on SATA. As of April 2010[update], the fastest 10,000 rpm SATA hard disk drives could transfer data at maximum (not average) rates of up to 157 MB/s, which is beyond the capabilities of the older PATA/133 specification and also exceeds the capabilities of SATA 1.5 Gbit/s. Continued compatibility with SAS, including SAS 6 Gbit/s. "A SAS domain may support attachment to and control of unmodified SATA devices connected directly into the SAS domain using the Serial ATA Tunneled Protocol (STP)" from the SATA Revision 3.0 Gold specification. DevSleep enables lower power consumption for always-on devices while they are in low-power modes such as InstantGo (which is formerly known as Connected Standby). The SATA standard defines a data cable with seven conductors (3 grounds and 4 active data lines in two pairs) and 8 mm wide wafer connectors on each end. SATA cables can have lengths up to 1 metre (3.3 ft), and connect one motherboard socket to one hard drive. PATA ribbon cables, in comparison, connect one motherboard socket to one or two hard drives, carry either 40 or 80 wires, and are limited to 45 centimetres (18 in) in length by the PATA specification; however, cables up to 90 centimetres (35 in) are readily available. Thus, SATA connectors and cables are easier to fit in closed spaces, and reduce obstructions to air cooling. Although they are more susceptible to accidental unplugging and breakage than PATA, users can purchase cables that have a locking feature, whereby a small (usually metal) spring holds the plug in the socket. A 15-pin SATA power connector; this particular connector is missing the 3.3 V (orange) wire. SATA specifies a different power connector than the decades-old four-pin Molex connector used on Parallel ATA (PATA) devices. It is a wafer-type connector, like the SATA data connector, but much wider (15 pins versus seven) to avoid confusion between the two. Some early SATA drives included the old 4-pin Molex power connector together with the new 15-pin connector, but most SATA drives now have only the latter. 3.3 V is supplied along with the traditional 5 V and 12 V supplies. However, very few drives actually use it, so they may be powered from an old 4-pin Molex connector with an adapter. Passive adapters are available that convert a 4-pin Molex connector to a SATA power connector, providing the 5 V and 12 V lines available on the Molex connector, but not 3.3 V. There are also 4-pin-Molex-to-SATA power adapters which include electronics to provide 3.3 V power additionally. However, most drives do not require the 3.3 V power line. SATA 2.6 is the first revision that defined the slimline connector, intended for smaller form-factors such as notebook optical drives. Pin #1 of the slimline signal connector, denoting device presence, is shorter than the others to allow hot-swapping. The slimline signal connector is identical and compatible with the standard version, while the power connector is reduced to six pins so it supplies only +5 V, and not +12 V or +3.3 V.
Low-cost adapters exist to convert between standard SATA to slimline SATA. A 1.8" (46 mm) micro SATA hard drive with numbered data and power pins on the connector. The micro connector (sometimes uSATA or μSATA), originated with SATA 2.6. It is intended for 1.8-inch (46 mm) hard drives. There is also a micro data connector, similar in appearance to but slightly thinner than the standard data connector. Aimed at the consumer market, eSATA enters an external storage market served also by the USB and FireWire interfaces. The SATA interface has certain advantages. Most external hard-disk-drive cases with FireWire or USB interfaces use either PATA or SATA drives and "bridges" to translate between the drives' interfaces and the enclosures' external ports; this bridging incurs some inefficiency. Some single disks can transfer 157 MB/s during real use, about four times the maximum transfer rate of USB 2.0 or FireWire 400 (IEEE 1394a) and almost twice as fast as the maximum transfer rate of FireWire 800. The S3200 FireWire 1394b spec reaches ~400 MB/s (3.2 Gbit/s), and USB 3.0 has a nominal speed of 5 Gbit/s. Some low-level drive features, such as S.M.A.R.T., may not operate through some USB  or FireWire or USB+FireWire bridges; eSATA does not suffer from these issues provided that the controller manufacturer (and its drivers) presents eSATA drives as ATA devices, rather than as "SCSI" devices, as has been common with Silicon Image, JMicron, and NVIDIA nForce drivers for Windows Vista. In those cases SATA drives do not have low-level features accessible. The eSATA version of SATA 6G operates at 6.0 Gbit/s (the term SATA III is being avoided by the SATA-IO organization to prevent confusion with SATA II 3.0 Gbit/s, which was colloquially referred to as "SATA 3G" [bps] or "SATA 300" [MB/s] since 1.5 Gbit/s SATA I and 1.5 Gbit/s SATA II were referred to as both "SATA 1.5G" [b/s] or "SATA 150" [MB/s]). eSATAp stands for powered eSATA. It is also known as Power over eSATA, Power eSATA, eSATA/USB Combo, or eSATA USB Hybrid Port (EUHP). An eSATAp port combines the 4 pins of the USB 2.0 (or earlier) port, the 7 pins of the eSATA port, and optionally two 12-volt power pins. Both SATA traffic and device power are integrated in a single cable, as is the case with USB but not eSATA. Power at 5 volts is provided through two USB pins; power at 12 Volts may optionally be provided. Typically desktop, but not notebook, computers provide 12 volt power, so can power devices requiring this voltage, typically 3.5" disk and CD/DVD drives, in addition to 5 volt devices such as 2.5" drives. Slim 2.5-inch SATA devices, 5 mm (0.20 inches) in height, use the 20-pin SFF-8784 edge connector to save space. By combining the data signals and power lines into a slim connector that effectively enables direct connection to the device's printed circuit board (PCB) without additional space-consuming connectors, SFF-8784 allows further internal layout compaction for portable devices such as ultrabooks. In addition to supporting legacy Advanced Host Controller Interface (AHCI), SATA Express also makes it possible for Non-Volatile Memory Express (NVMe) to be used as the logical device interface for connected PCI Express storage devices. M.2, formerly known as the Next Generation Form Factor (NGFF), is a specification for computer expansion cards and associated connectors. 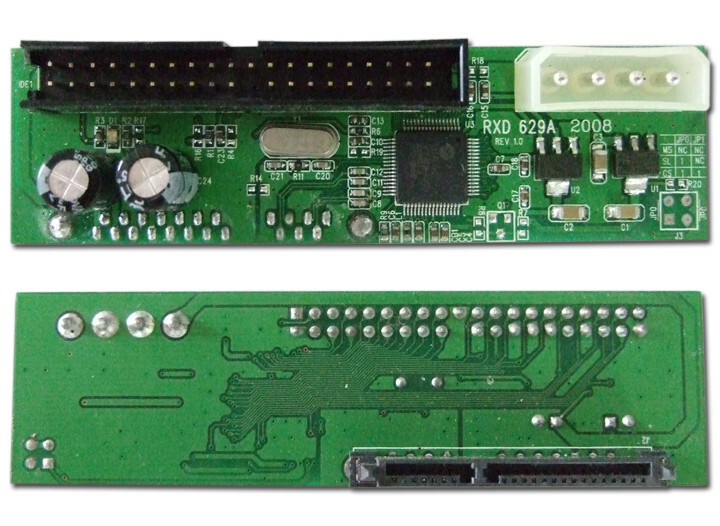 It is intended to replace mSATA, which uses the PCI Express Mini Card physical layout. Having a smaller and more flexible physical specification, together with more advanced features, the M.2 is more suitable for solid-state storage applications in general, especially when used in small devices like ultrabooks or tablets. Also, SATA uses some of the special characters defined in 8b/10b. In particular, the PHY layer uses the comma (K28.5) character to maintain symbol-alignment. A specific 4-symbol sequence, the ALIGN primitive, is used for clock rate-matching between the two devices on the link. Other special symbols communicate flow control information produced and consumed in the higher layers (link and transport). Separate point-to-point AC-coupled low voltage differential signaling (LVDS) links are used for physical transmission between host and drive. SATA topology: host (H), multiplier (M), and device (D). SATA uses a point-to-point architecture. The physical connection between a controller and a storage device is not shared among other controllers and storage devices. SATA defines multipliers, which allows a single SATA controller port to drive up to 15 storage devices. The multiplier performs the function of a hub; the controller and each storage device is connected to the hub. This is conceptually similar to SAS expanders. Modern[update] PC systems have SATA controllers built into the motherboard, typically featuring 2 to 8 ports. Additional ports can be installed through add-in SATA host adapters (available in variety of bus-interfaces: USB, PCI, PCIe). The designers of SATA aimed for backward and forward compatibility with future revisions of the SATA standard. To prevent interoperability problems that could occur when next generation SATA drives are installed on motherboards with standard legacy SATA 1.5 Gbit/s host controllers, many manufacturers have made it easy to switch those newer drives to the previous standard's mode. For example, Seagate/Maxtor has added a user-accessible jumper-switch, known as the "force 150", to enable the drive switch between forced 1.5 Gbit/s and 1.5/3 Gbit/s negotiated operation. Western Digital uses a jumper setting called "OPT1 enabled" to force 1.5 Gbit/s data transfer speed (OPT1 is enabled by putting the jumper on pins 5 and 6). Samsung drives can be forced to 1.5 Gbit/s mode using software that may be downloaded from the manufacturer's website. Configuring some Samsung drives in this manner requires the temporary use of a SATA-2 (SATA 3.0 Gbit/s) controller while programming the drive. Parallel SCSI uses a more complex bus than SATA, usually resulting in higher manufacturing costs. SCSI buses also allow connection of several drives on one shared channel, whereas SATA allows one drive per channel, unless using a port multiplier. Serial Attached SCSI uses the same physical interconnects as SATA, and most SAS HBAs also support SATA devices. SATA 3 Gbit/s theoretically offers a maximum bandwidth of 300 MB/s per device which is only slightly lower than the rated speed for SCSI Ultra 320 with a maximum of 320 MB/s in total for all devices on a bus. SCSI drives provide greater sustained throughput than multiple SATA drives connected via a simple (i.e. command-based) port multiplier because of disconnect-reconnect and aggregating performance. In general, SATA devices link compatibly to SAS enclosures and adapters, whereas SCSI devices cannot be directly connected to a SATA bus. Unlike PATA, both SATA and eSATA support hot-swapping by design. However, this feature requires proper support at the host, device (drive), and operating-system levels. In general, all SATA devices (drives) support hot-swapping (due to the requirements on the device-side), also most SATA host adapters support this command. ↑ 16 Gbit/s raw bit rate, with 128b/130b encoding. ↑ 15 ns cycles, 16-bit transfers. ↑ 10 Gbit/s raw bit rate, with 128b/132b encoding.